The International Organization of Migration reported that approximately 4000 migrants had died while trying to cross the ​Mediterranean Sea in the year of 2016, and approximately 3000 by the tenth month of 2017. 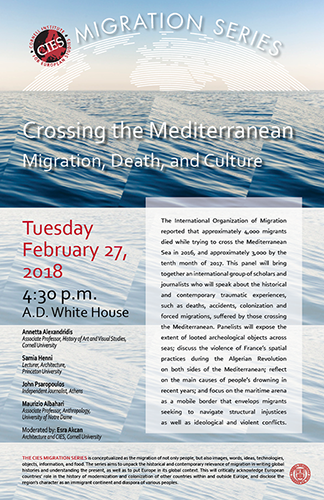 This panel will bring together an international group of scholars and journalists who will speak about the historical and contemporary traumatic experiences, such as deaths, accidents, colonization and forced migrations, suffered by those crossing the Mediterranean. Panelists will expose the extent of looted archeological objects across seas; discuss the violence of France’s spatial practices during the Algerian Revolution on both sides of the Mediterranean; ­ reflect on the main causes of people's drowning in recent years; and focus on the maritime arena as a mobile border that envelops migrants seeking to navigate structural injustices as well as ideological and violent conflicts. Maurizio Albahari (Ph.D., UC Irvine) is Associate Professor of Anthropology at the University of Notre Dame. He is the author of several news editorials and interdisciplinary articles on refugee mobility and related civic engagement, and of the books Crimes of Peace: Mediterranean Migrations at the World’s Deadliest Border (University of Pennsylvania Press, 2015) and Tra la Guerra e il Mare: Democrazia Migrante e Crimini di Pace (ManifestoLibri, Rome, 2017). Annetta Alexandridis is Associate Professor of Greek and Roman Art and Archaeology in the Departments of History of Art and of Classics at Cornell University. Her publications and research interests center around Roman portraiture and funerary culture; Greek myth and iconography; gender studies; humans and animals and archaeology and its media such as photography or plaster casts. She is a field member of the Archaeological Exploration of Sardis in Turkey. Samia Henni (Ph.D. ETH-Zurich) is an architect and an architectural historian, whose research focuses on the intersection of architecture, planning, colonial practices, and military operations from the early 19th century up to the present days. She is the author of Architecture of Counterrevolution: The French Army in Northern Algeria (gta Verlag, 2017), and the curator of the exhibition Discreet Violence: Architecture and the French War in Algeria at the gta Institute, ETH Zurich; Het Nieuwe Instituut, Rotterdam; and Archive Kabinett, Berlin. Currently, she teaches at Princeton University's School of Architecture. John Psaropoulos is an independent journalist based in Athens. He has covered Greece and southeast Europe since the fall of communism. He has been Al Jazeera International's Greece correspondent since 2012. John holds a BA and MA in Ancient Greek from King's College London. He cut his teeth in journalism working as a producer for CNN International in Atlanta. From 1999 to 2009 he was Editor-in-chief of the Athens News, Greece's historic, English-language newspaper. He has written for numerous publications including The Weekly Standard, The American Scholar, The Daily Beast, the Times Literary Supplement and The Washington Post. His personal blog is thenewathenian.com. This panel is part of CIES’ Migration Series. The event includes a reception.